Make your announcements bigger, bolder, brighter, and shinier. The flyer’s lustrous, metallic sheen draws a customer’s attention to the important details. The metallic foil highlights a sale discount, event location and time, or your company’s new logo. A metallic foil flyer gives a shiny, metallic accent to the one or both sides of your design. Choose from five sophisticated shades: gold, silver, copper, black, blue, or red. Add a luxurious touch to your premium brand’s product launch details or bring in the holiday cheer with these extra dazzling colors. Don’t limit yourself to one or two shades. You’re free to include your own gradients and add several colors of foil on the same side. 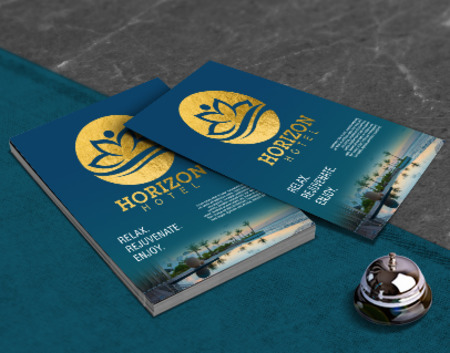 Complement the metallic sheen with a few spot UV elements on the other side of your custom flyers. Spot UV printing applies a high gloss layer on a specific area of the flyer. Its extra shiny surface adds to the festive or luxurious branding of your entire design. You can choose to have spot UV printing on the front, back, or both sides. Your flyer design is printed on 16 pt Cardstock, which is our thickest and most premium material available. Its substantial weight allows for spot UV and metallic flyer printing on both sides. We help you set the standard for sophistication with two premium coating options. Both provide high levels of shine that match the luxury of your metallic foil flyer design. We offer a wide range of promotional flyer sizes that are both handy and easy to store. Select a size that suits your flyer design and makes the most out of the metallic foil elements. 8.5” x 11” is the most popular size for flyers, with ample space for a central or several imagery elements. 6” x 9” is easy to hand out and for customers to keep. You can highlight an image, company logo, or a big announcement in metallic typography. 5” x 7” is one of the smaller sizes available. It's perfect for announcements highlighting a major sale or an upcoming event. You could also add rounded corners to give your flyers an extra distinctive design. PrintPlace makes it easy to set up your metallic flyer printing. Upload your flyer design online or download one of our templates to get you started. What are the best ways to design a metallic flyer? Have a clear focal point. The flyer should immediately shift the customer’s focus to your main point. Use attractive and functional imagery. People register visuals over text. Your flyer should have graphics or images that show them what the announcement is all about. Strike a balance. Don’t overdo the application of metallic foil or spot UV printing in your design. Sometimes less is more, so you could have a few words or images in metallic foil. Have one central image or typography in metallic foil. This allows the gloss coating to contrast the shine. By when can I expect my metallic flyer order? The “ready to ship in time” refers to the time it takes to produce your order. Standard business cards can be ready for shipping after 7 business days. Input your zip code at the bottom of the calculator to find out the exact date of arrival. Our layout templates will show you how to format your artwork. This ensures your metallic flyers print correctly. Our metallic flyer layout templates are downloadable as EPS, PDF, JPG, and Publisher files through a desktop computer. Metallic flyer printing gives your company a unique opportunity to stand out. Here a few ways you can utilize the extra shine and distinction of a metallic foil flyer. Go loud and proud with a big announcement. Is your store opening a new branch or launching a new product? Are you planning an event that demands hundreds of attendees? Metallic foil can peak anyone’s interest upon seeing your flyer. Highlight the important details. Once you have the customer’s attention, it’s crucial to keep their focus. Apply spot UV printing on the event’s venue and time. Distinguish the store’s discount price in a metallic gold or copper. Go for double sided printing. Flyers are meant to be handed out and as a reference for future reading. If your announcement has additional details, utilize the other side for whatever else customers need to know.